I arrived to a picture perfect Amsterdam—cloudy and misty, a cool breeze. 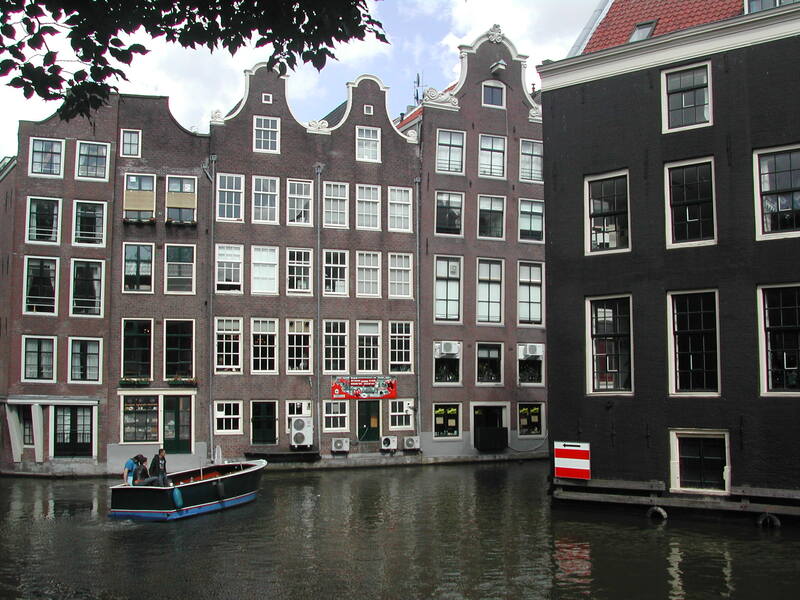 This gave a mythical quality to the juxtaposition of dark green canals and the colorful homes—whites and beiges and a black with purple—along their edges, some seemingly growing right out of the water. The homes are erected tightly side-by-side. Some homes lean a bit forward (it was learned that it was easier to hoist furniture this way), others sideways enough to notice. All homes, from their rooftops, dangle pulleys attached to very ornate arms that are beefy enough to sustain the weight of furnishings raised into apartments. Going inside with furniture and up narrow stairs or in one and two person elevators just can’t cut it. Furnishings must go into a home through the very large windows. The houses are very narrow; this is because at one point, homeowners were taxed according to width. By 2PM (14:00 hrs) of my first day, the sun was out and the breeze only occasional. There always seems to be a breeze here, sometimes gusting into a strong wind that can last several minutes. The leaves rustle violently. The canals kick up a bit. Most people ware some sort of jacket because in the shade it can get cool—and every café has plenty of shade. The sun magnified the multitudes on the streets; it was like a spot light. Droves and droves of people form all over the place. Enumerable languages everywhere: all the European languages, but a lot of Spanish and Italian; Arabic, Turkish, Greek and so on; likewise multitudes from Asia and South Asia. The restaurants reflect this. For every language there is a restaurant. I counted 5 Argentinean restaurants, though I didn’t try any because, well, I’ve eaten the food there. Why compromise? 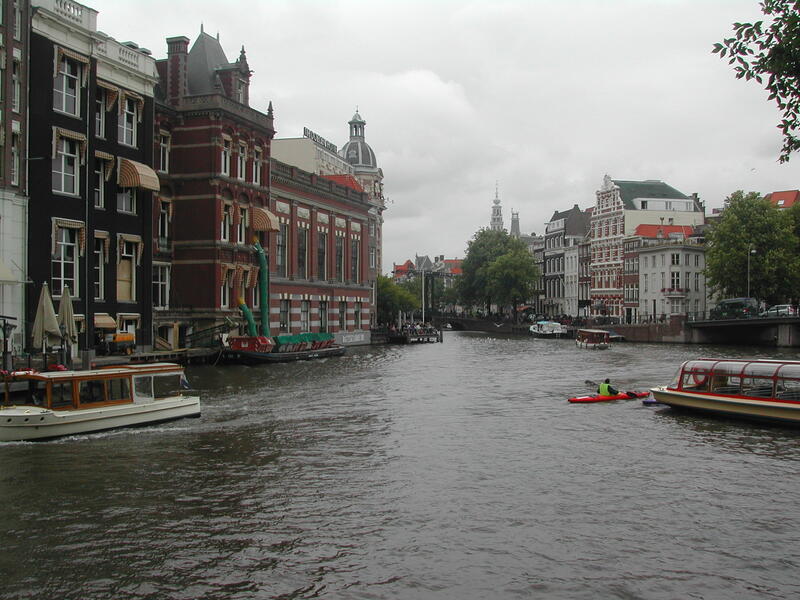 Amsterdam is an amalgamation of cultures and systems and beliefs. Amsterdam is a peculiar, pleasant human experiment—old world and new, the citizens appear to have found a soothing aesthetic. It’s a laid back approach to labor; it’s not laid back in the sense of an Argentinean “piola,” don’t worry, tomorrow it’ll be better. No, this a particular soft energy applied to the comings and goings of life. There is constant movement in Amsterdam. It’s visible in the walking, bicycling and traming (electric trams). The main roads have a lane for the tram, which requires tracks since they run on overhead electricity (the lines web the city). Next to the tram lane, on either side, are the auto lanes and the bike lanes, which sometimes come into the sidewalk as well on one side so as to not interfere with walkers and strollers (that’s me). It’s all rhythmic, ruled by understanding, tolerance and patience—the bell of the tram announcing it’s near so that walkers and bikers get out of the way; the constantly ringing bells of the bikers weaving in-between walkers; the low purr of the walkers and café dwellers. The Amsterdam biker is quite experienced. They flow through crowds effortlessly on variations of English racers ringing their bells—watch out. Never hostility uttered at anyone. The Amsterdam biker is apparently negotiating a deeper melody. Some bikes have a front extension that looks like a small dingy. This is for kids and groceries. No one wares a helmet. It all works. Along some streets and in the plazas, they’ve gone one up on the French: in front of the first line of tables in many cafés they’ve taken to placing chairs, side-by-side and facing out theatre-like and, well, the whole world is your stage. Sometimes this row of chairs is along the back against the wall of the café. This is very interesting and I think a sign of Amsterdam’s pleasantness; that is, Amsterdam’s allure, beyond its architectural, historical and artistic beauty and magnetism, is in its understanding that the human condition is very complex and that this complexity requires an open admission that in order to even approximate harmony, tolerance for our needs and desires, as bizarre as these may be sometimes, needs to be accommodated. Amsterdam is accommodating. The underlying ethos is to not make waves. This is evident in the energy on the streets, first—the way machine and humanity and environment interact in soft ways. It then extends to extremes—from Rembrandt to Van Gogh, the orthodox to the most liberal, even if this is on the borderlines of the bizarre. 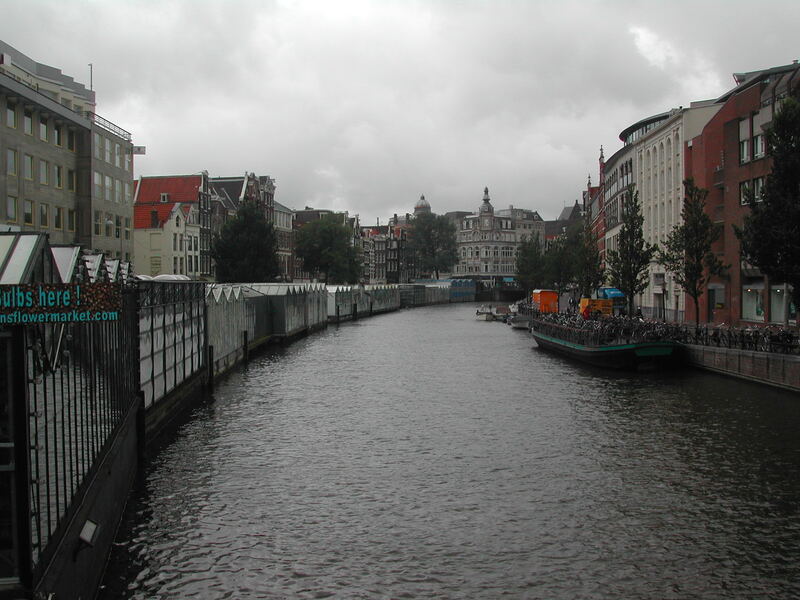 Amsterdam is a very interesting human experiment that has grown and evolved along these canals. Can society, small as it is here, tolerate extreme needs and differences? Can displaced persons from all over the world, some from places marked by war and devastation, come together and simply live together and in this form manifest something for tomorrow? The Politie (police), many very young, patrol the streets on bicycles. They’re dressed casually—a white shirt with insignias, dark blue combat pants and boots, radios and guns (some don’t have guns). They work on containing the excitement in certain areas, as in the Red Light District, and weave in and out of the center of the flow of the crowds looking for any sign of potential eruption that would require defusing. This is very uncommon, though; most of the time their presence is enough and people go on about their merry business. There are the boisterous men, young and old. 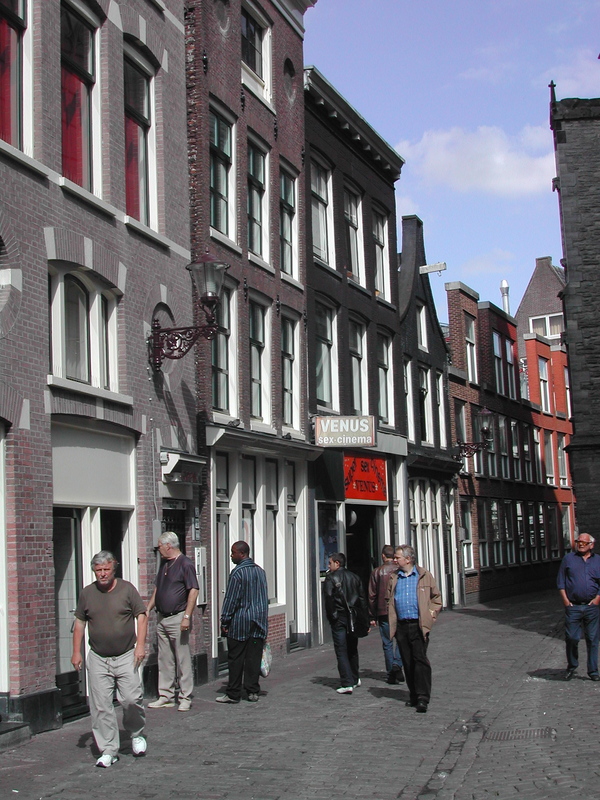 These international and diverse bans walk throughout the city but are most evident in the Red Light District. These bans span cultures; some are intermixed, diverse. Most are working class kids looking for kicks. The most annoying are the English and the Americans. Boy can they drink, particularly the Brits. It’s not enough to drink for them—you have to we wobbling down the street yelling and screaming. The American youths follow a close second to this. These groups don’t raise any problems; they’re contained within their own worlds. If anything the harm they might do is to themselves. But even this gesturing is understood and not threatening, seen as yet another group—the immature, testosterone confused man needing to obtain some sort of image to conceal vulnerabilities. A lot is tolerated here—and maybe this is something to learn from. While church bells mark the hour to God, men stroll before bikini-clad women standing provocatively in small booths, as if mannequins on 5th Avenue in New York. The booth is strange, it’s both a calling forth, an advertisement, and a complex gesture towards the womb since it too represents a type of protection. The women open their glass doors slightly and whisper to men and strike their deals. Some booths, the more daring, sport 2 women. It’s a bizarre and very strange world. In-between this very open admission that the oldest profession is alive and well—and supported by Mastercard and Visa, state healthcare and inspectors, and government—are cafés, beautiful homes, fantastic shops, bookstore and restaurants. The blend is incredible. You have to ponder it a bit and take it in it’s so grave. Naturally, this kind of openness brings in “the other,” the hard drugs—coke and heroine sold, in whispers, by Africans on the street. This is totally illegal, of course. But we know from experience that once one form—alcohol and pot—are tolerated, even sanctified, then “the other” will creep in. Perhaps this is a challenge: if you’re going to go this far, why not go all the way? What else will that bring from the narrative of unintended consequences? The atmosphere in the Red Light District is interesting. Families, kids, young and old travel the streets; however, “the man” is obviously the dominant force. The essence of this area is male. This is obvious to anyone walking across a canal bridge and on its edge is a urinal, sometimes two. These urinals are open to the world; that is, they are porta-lets with only small holes to satiate men’s immediate need. On any given occasion you see several men, one per open toilet, pushed in so that digital video cameras don’t end up catching a glimpse of their one unique problem in life and cast it to the world via Google. (This is a culture under constant surveillance, cameras everywhere; this is something I’ve seen everywhere I’ve been—everyone is being photographed and filmed by the state.) Nothing like a good pee out in the open among the crowds after that double espresso. For women, there is no such comfort. I love Amsterdam. I believe it has to be and that we have to try and understand what this means to us. I love the city’s energy and tolerance. But it’s a stark reminder of how complex and perverse we humans are. The entire world is here. What really comes through is that humanity really lives in one very old system. On one end of the spectrum, the state apparatuses and the ideological apparatuses; then gentrification, the push for humanism and environmentalism, a good life with just enough “things” coupled to an aesthetic that is earthy. And on the other end, the need of some to work out insecurities, vulnerabilities and confusions in more edgy forms. Very often, the two worlds synthesize, are side-by-side. An old system laid bare and supported quite well by business and government. It’s a vertical system without seeming to be so, a fascinating slight of hand. But in-between the canal boats slowly making their way, people jubilant, and in-between the shadows that are always available to us in such extremes, even when gracefully melded together as they are here, are the children. These are the kids that are being towed by parents—everywhere; and the young alone on the streets. You wonder what they see; you wonder what it is we’re saying to them about how they are to live. And then, for me, the most challenging image is how young some of these young girls in their booths are—younger then my college age daughter. How is it that some can only find the oldest profession as a way through life? I was left with that thought. It hangs heavy. In all, I believe in the Amsterdam experience that may find you listening to church bells while staring at a Jamie Lynn Cyberskin Vibrating Doll. There is quite a lot to learn from this experiment in humanity. Maybe al Andalus was something like this—tolerance alongside broad accommodations made to differences, yet beyond the surface structure of liberty and equality, there is a highly structured, vertical society—the rich and the poor, and everything in-between; the ideological class and the state class; labor; artists. And all this supported by the globalization of money that enables but a few to control both ends of this same equation. This is the oldest system: comoflouage the hierarchy with tolerance for the many vicissitudes that will undoubtedly arise. It’s a good means of control. 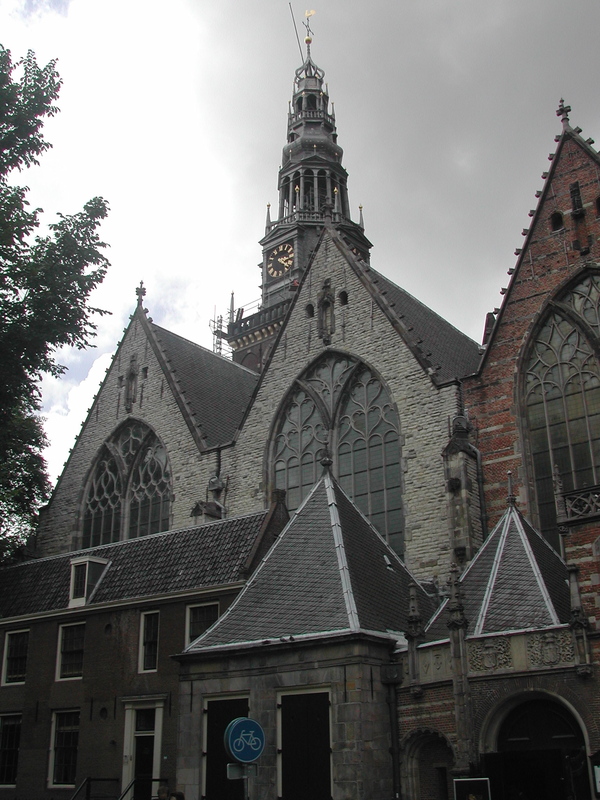 This entry was posted in cultural studies, travel and tagged Amsterdam, cultural studies, travel by hector. Bookmark the permalink. I think that one of the reasons cities such as Amsterdam have these “red light districts” andjextremes that we continue to bring up is because we are forced to suppress so many of our inner desires. We spoke in class about males being forced to disguise any homosexual or sentimental feelings they may have toward other men. In reaction to this, we find hyper-masculine men jumping all over each other in an area that supports this: sports. Sports are a “socially acceptable” way for us to work out aggression, frustration, any emotion. I think sports can sometimes simply be replacements for alternatives such as the red light district or church. On one hand it is a place to work out any sexual desires and on the other it can be a sanctuary that protects you from the outside world and provides clear guidelines and boundaries. You can be someone on the field that you’re not in your daily life. Walk into a bar in Boston on a Friday night and the people you meet there will most likely act differently than if you were to meet them on a Tuesday afternoon. All of these things allow us to be someone that our society won’t. I totally agree with lani that our society feels the need to disguise our feelings in order to appear “strong” and “superior” in everything. Clearly it is not possible to completely ignore all of these unwanted feelings, so we turn to sports. In our culture, even the spectator can release their pent up emotions. However, when we cannot achieve this through sporting events, we travel to Europe to experience this other, more tolerant world in Amsterdam to release our desires. This release is not necessarily a healthy outlet though, for while the people of Amsterdam have found a happy medium in which to express themselves, Americans go to the red light district and get outrageously intoxicated. The examples of Americans that Professor Vila gave in his blog represent just how dependent Americans are on achieving the extreme, thus we have no other consistent choice than to turn to sports to fulfill our desires.